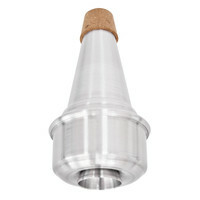 The Gear4music Trombone Wah mute is an ideal accessory for brass players who play in orchestras and jazz bands. Also known as a harmon this mute features a sound hole that can be covered by the hand to create the wah sound effect. The extending tube also allows the player to get a number of different timbres and colours out of their instrument.